"Best of the Main Line"
Location in Delaware County and the state of Pennsylvania. Radnor Township is a township with home rule status in Delaware County, Pennsylvania, United States. It contains the unincorporated communities of Garrett Hill, Rosemont, Strafford, Villanova and Wayne as well a portion of the census designated place of Bryn Mawr and Newtown Square. As of the 2010 census, the township population was 31,531. Radnor Township lies along the Main Line, a collection of upper-middle class and upper-class Philadelphia suburbs. Villanova University, Cabrini University, the Valley Forge Military Academy and College and Eastern University are all located within Radnor Township. Memorial mile post on U.S. 30 in front of the Anthony Wayne Theater and the AT&T tower in the background. In 1681 Richard Davies purchased 5,000 acres from William Penn. These lands were sold to various purchasers and were mainly in the location of current Radnor Township. The township was part of the Welsh Tract and was named for Radnorshire in Wales. In 1717, the Welsh Friends erected a Quaker meetinghouse ( Radnor Friends Meetinghouse) near what is now the intersection of Conestoga Road and Sproul Road at the geographic center of the township. The new town, "Radnorville", later known as the community of "Ithan" after nearby Ithan Creek, grew around the meetinghouse. The Welsh influence waned in the late 18th century as many left the area due to high taxation. Stone monuments were erected in various locations throughout the township in the late 20th century to commemorate the township's Welsh heritage. The main house at Chanticleer Garden. Lancaster Pike, the first toll road in the United States, connected the cities of Philadelphia and Lancaster, Pennsylvania, passing through Radnor Township, opened in 1794. That road is now part of the Lincoln Highway ( U.S. Route 30). The Columbia Railroad, later part of the Pennsylvania Railroad also passed through in 1832. Thus, Radnor is one of the towns associated with the local moniker "Main Line." A separate railroad passing through Radnor Township, the Philadelphia and Western Railroad, was opened in the early 20th century. The "Main Line" railroad facilities and a portion of the P&W facilities are still used by SEPTA (the Philadelphia area's transit authority), and the "Main Line" railroad tracks are owned and used by AMTRAK. In the 1880s, George W. Childs bought property in the community of Louella in the western part of Radnor Township, renamed the area Wayne, Pennsylvania (after American Revolutionary War hero Anthony Wayne) and organized one of the United States's first suburban developments. According to the United States Census Bureau, the township has a total area of 13.8 square miles (35.7 km²), of which 13.8 square miles (35.6 km²) of it is land and 0.07% is water. Waterways in Radnor Township include Darby Creek, Ithan Creek, Little Darby Creek, Meadowbrook Run and Gulph Creek. As of Census 2010, the racial makeup of the township was 85.8% White, 3.9% African American, 0.2% Native American, 7.9% Asian, 0.6% from other races, and 1.6% from two or more races. Hispanic or Latino of any race were 3.0% of the population . As of the census  of 2000, there were 30,878 people, 10,347 households, and 6,373 families residing in the township. The population density was 2,244.3 inhabitants per square mile (866.4/km²). There were 10,731 housing units at an average density of 779.9 per square mile (301.1/km²). The racial makeup of the township was 89.55% White, 5.67% Asian, 3.09% African American, 0.08% Native American, 0.02% Pacific Islander, 0.62% from other races, and 0.98% from two or more races. 2.03% of the population were Hispanic or Latino of any race. There were 10,347 households, out of which 29.4% had children under the age of 18 living with them, 52.9% were married couples living together, 6.8% had a female householder with no husband present, and 38.4% were non-families. 31.1% of all households were made up of individuals, and 12.1% had someone living alone who was 65 years of age or older. The average household size was 2.39 and the average family size was 3.08. In the township the population was spread out, with 19.5% under the age of 18, 24.0% from 18 to 24, 22.5% from 25 to 44, 20.6% from 45 to 64, and 13.4% who were 65 years of age or older. The median age was 32 years. For every 100 females, there were 87.2 males. For every 100 females age 18 and over, there were 83.6 males. A map, c. 1895, showing most of Radnor Township together with other communities on the Pennsylvania Main Line. Lincoln Financial Group is headquartered in Radnor Township. In 2007 the company moved 400 employees, including its top executives, to Radnor from Philadelphia. Other companies based in Radnor Township include, J. G. Wentworth, TV Guide magazine and Airgas. Pupils in Radnor Township attend Radnor Township School District. Radnor High School and Radnor Middle School are the sole public high and middle schools of the district. There are three elementary schools in the RTSD: Radnor Elementary School, Ithan Elementary School, and Wayne Elementary School. Archbishop John Carroll High School, a Roman Catholic High School in the Archdiocese of Philadelphia. Valley Forge Military Academy and College contains a boarding school program for seventh through twelfth grades. The Agnes Irwin School is an all-girls school for prekindergarten through twelfth grade. St. Katharine of Siena is a Catholic school in Wayne for students in kindergarten through eighth grade. The Hill Top Preparatory School is a school located in Ithan for students with learning disabilities in fifth through twelfth grade. Villanova University, Eastern University, and Cabrini University are located within Radnor Township. Valley Forge Military Academy and College operates a two-year junior college. SEPTA Suburban Bus Route 106 bus runs directly through the center of Radnor Township. The route is primarily on Lancaster Avenue until the community of Radnor, where buses turn left on King of Prussia Road after passing under the Blue Route. At the intersection of King of Prussia and Radnor-Chester Roads, it turns left again onto North Radnor-Chester Road. At the intersection of Radnor-Chester Road and Lancaster Avenue, it turns right and continues on Lancaster Avenue for the rest of its time within township borders. As a result of this loop, the 106 provides bus service to students who attend Radnor High School on King of Prussia Road. The 106 serves the communities of Rosemont, Villanova, St. Davids, Radnor, and Wayne with westbound access to Paoli and eastbound access to the 69th Street Transportation Center in Upper Darby. The 105 bus formerly drove a route similar to that of the 106, but a 2016 schedule change moved the route's western terminus to Rosemont Station, on Montrose Avenue near the border of Radnor Township and Lower Merion Township. As of 2017, the route runs parallel to Radnor Township's border on Airedale Road, but never enters the township. Occasionally, SEPTA will utilize a bus to serve stations on the Norristown High Speed Line, especially during times of inclement weather during which the tracks are rendered unusable, such as during and after extreme snowfalls. These buses will bear "NHSL" on their destination sign as opposed to a bus route number. ^ Ashmeade, Henry Graham (1884). History of Delaware County, Pennsylvania. 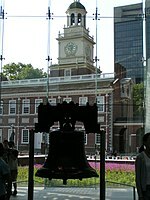 Philadelphia: L.H. Everts & Co. p. 678. Retrieved 16 June 2017. ^ Espenshade, A. Howry (1925). Pennsylvania place names. State College, PA: The Pennsylvania State College. p. 246. ^ "Item No. :78002394 NRIS (National Register Information System)". National Park Service. Archived from the original on 2013-02-20. Retrieved 2008-09-26. ^ " Radnor township, Pennsylvania[ permanent dead link]." U.S. Census Bureau. Retrieved on August 20, 2009. ^ Blumenthal, Jeff. " Lincoln sells Delaware Investments." Philadelphia Business Journal. Wednesday August 19, 2009. Modified Thursday August 20, 2009. Retrieved on August 24, 2009. 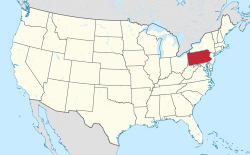 ^ Delaware County, Pennsylvania Highway Map (PDF) (Map). PennDOT. 2015. Retrieved January 25, 2016. ^ a b SEPTA Official Transit & Street Map Suburban (PDF) (Map). SEPTA. Retrieved May 2, 2016.